Walking Overhead Lunges are an effective exercise for building the quadriceps, hamstrings, gluteus muscles, calves, shoulders, upper back and traps. The core is actively engaged in this exercise to accommodate shifts in bodyweight and to keep the upper body and lower back supported. Walking Overhead Lunge will develop stability, mobility, flexibility and strength in the hips and legs. Press a barbell plate overhead and assume a hip width position. Your hands, shoulders, lat muscles and hips must be aligned with your feet. Keep your arms fully extended and locked out. Lunge forward with one leg. The lunge should be far enough that the forward shin is vertical with the knee in line with the heel. The back knee should be in line with the hip and shoulder. Push off with the back leg then lunge forward with the other leg. One of the most common faults in Walking Overhead Lunges is lunging while leaning too far forward. 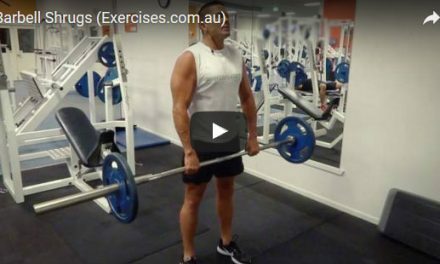 This will thrust your upper body and the barbell plate forward and make you lose balance. It will also make it harder to push off from the back foot. Another common fault is taking a short lunge which places the knee over the toes. This puts more shearing forces on the knee which increases the risk of injury as you push off with the back foot.